Commuters walked through a tunnel after a power outage on the Blue Line. The Blue Line lurched back into full service around 10:40 a.m. Thursday after the MBTA restored full power to the subway line after an outage stranded hundreds inside the tunnel outside the Maverick Square station in East Boston. The outage - the second this week - was first reported around 8:30 a.m. and forced commuters to use shuttle buses between East Boston and Government Center or find alternatives like the water taxi that operates between East Boston and downtown. A train left the Maverick station and was a short distance from the platform when the power failed and the train came to a complete halt. Transit Police and Boston firefighters entered the tunnel and escorted the stranded passengers back to the platform, officials said. Casey Billings was one of those passengers, and he shared his experience on Twitter. 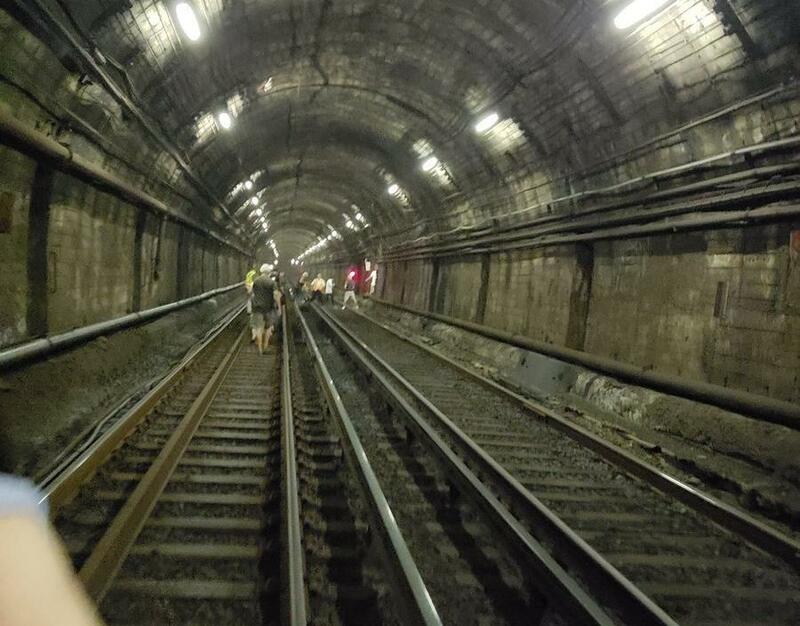 “Unscheduled group tour of the inner workings of the #Blueline #MBTA tunnels this morning on the way to work,” he wrote. 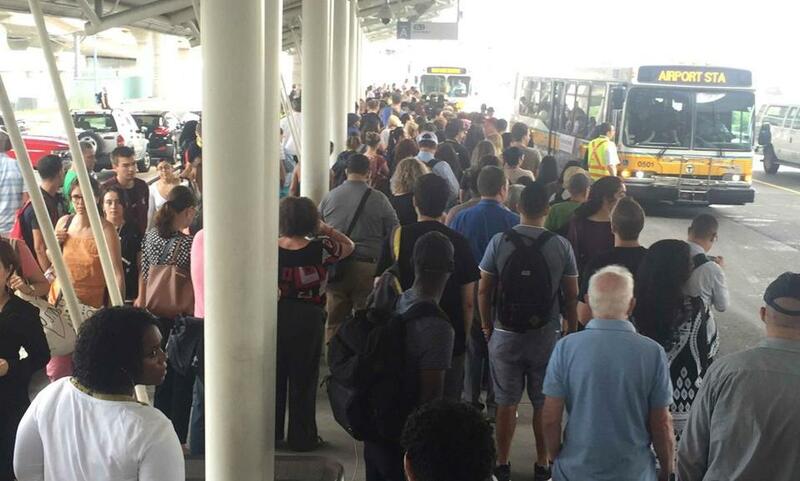 Vanessa Delgado said it took her an hour and 20 minutes to get from Beachmont station in Revere to Airport station, where the MBTA was running shuttle buses downtown. She was headed to Aquarium station, a trip that Delgado said normally takes 15 minutes. “It’s very bad. It’s awful,” she said. Lois MacDonald, a legal assistant who works in downtown Boston, said she’s never been so late for work. She said she would typically arrive at the office at about 9 a.m., but at about 10 a.m. she was boarding a shuttle bus at Airport station. Despite the delays, MacDonald said MBTA staff treated her with courtesy. The Blue Line, she said, rarely experiences long delays and she said her employer understands why she was running late. “I’m not that rattled,” MacDonald said. The Aquarium station in downtown Boston was sparse around 9 a.m. after many commuters had called taxis and rideshares to work, but at least a dozen waited in the tunnel after receiving an alert about a single train in operation. Victoria Bonilla, an attorney bound for East Boston, fanned herself with her documents while waiting in the humid station. “I’ve already paid my money for the month to ride the train. I’m not trying to pay more to Uber to get to work,” said Bonilla. Although she had already contacted her clients about her late arrival, Bonilla began to consider finding a substitute attorney after nearly an hour of waiting. At about 9:30 a.m., a train arrived heading for Wonderland, receiving mild applause from passengers. A few minutes after boarding, a T employee called for them to get off, receiving many groans in response. Passengers waited for shuttles at Airport Station Thursday morning. At the Government Center station, an endless stream of shuttle buses from Maverick, Aquarium, and Airport stations unloaded and loaded passengers. Once commuters disembarked, many frantically bolted in various directions, often bumping into each another. “I’ve had enough,” said Matilda Arreza, who had started her commute at the Wonderland station. She had been caught behind the delayed train at Maverick and waited about 45 minutes for the shuttle to Government Station. “I’ve been traveling for about an hour and I still have to catch another train,” she said as she walked towards the station to catch the Green Line. At about 10:15 a.m., Robert and Emma Miller were standing outside Government Center station with their grandsons, hoping to catch their 11:30 a.m. flight home to Texas. The Blue Line also lost power during the Tuesday morning commute, forcing passengers to use shuttle buses and reducing service on the train for about three hours.